"The average audiophile can only dream of ultimate high-end performance." That myth has now been shattered by Acrolink's 7N-A2070 interconnect. Utilizing 7 nines pure stress free copper, exotic anti-resonance and anti-EMI materials and the world's finest connectors (the same ones used in our top-of-the-line Mexcel Series), the 2070 exudes "world class", but at a price that won't take your breath away. Second only to the Acrolink Mexcel Series, the 2070 sets the world standard for price/performance ratio. Created exclusively by Mitsubishi Materials Corporation to Acrolink's exacting specifications, our new 7N copper sets a new benchmark in high-end signal transmission. The super fidelity of Mitsubishi Materials' 7N Cu is comparable only to 8N Cu. This new 7N Cu is embraced by our new generation interconnect 7N-A2070. Employing balanced two core structure, 7N-A2070 follows in the footsteps of our overwhelmingly popular 8N-A2080 and uses all-new high-tech materials in every aspect of its construction. The conductor of 7N-A2070 is treated with our traditional Stressfree process to maintain uniformity of its crystalline structure against external forces, and then insulated with an Ultra High Polymer of Polyolefin which an extremely low dielectric constant. We have addressed the issue of unwanted resonance by developing a revolutionary new sheath material. Ultra high density tungsten granules are combined with amorphous metal and graphite granules in carefully formulated and proven proportions. These elements are then mixed into the sheath material in order to very effectively eliminate spurious resonance within the cable. We have also deployed our original non-magnetic thread to absorb electro-magnetic interference. The shielding layer is a composite of copper foil and braided UEW coated copper wires, ensuring improved protection against a wide frequency range of external noise and interference. 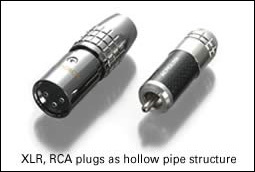 Connecting plugs; Our RCA plug has a completely iron free and deoxidized phosphor bronze center pin with a hollow structure, which is polished to a mirror finish and then plated with the highest quality rhodium. It is fitted with a carbon fiber sleeve in order to further eliminate resonance and interference. Our XLR plug also has hollow phosphor bronze pins which have been finished in the same manner of course. The hollow pins increase the effective surface thereby improving high frequency transmission and aiding in the realization of perfect impedance. The outer casing is precision machined out of solid brass to provide extra weight in order to suppress contact resonance. 7N-A2070 sets a new standard for quietness, clarity of sound and extended sound-stage. It has been designed to "disappear", thereby allowing you to make a more direct and enjoyable connection with your favourite music…all for music.